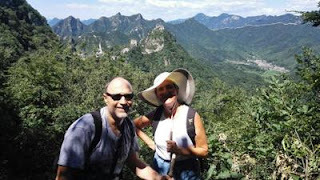 This Great Wall hike, which is relatively easy, makes for a great family day out at the Great Wall. Like the hike from Jinshanling to Simatai, this program is a exceptional for those who only have a little time in Beijing and want to get the most out of their Great Wall experience. This hike starts at the Great Wall of Jiankou, which features some amazing ruins and scenes of rustic beauty. The wall here is in its unrestored state, and is quickly becoming popular for photographers and Great Wall enthusiasts alike. Midway through the hike you'll pass over into the Great Wall at Mutianyu, which might be the most famous section of the Great Wall. With grand watchtowers and lovely brickwork, it is striking contrast to Jiankou, allowing you to compare and contrast these two sections of the Great Wall.